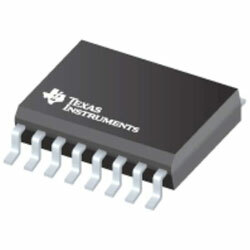 Texas Instruments ISO7041 Four-Channel Digital Isolator is an ultra-low power, multichannel digital isolator that can be employed to isolate CMOS or LVCMOS digital I/Os. Each isolation channel has a logic input and output buffer divided by a double capacitive silicon dioxide insulation barrier. Innovative edge based architecture coupled with an ON-OFF keying modulation scheme enables these isolators to use very-low-power while satisfying 3000VRMS isolation rating per UL1577. The per channel dynamic current usage of the device is under 120µA/Mbps and the per channel static current consumed is 4.2µA at 3.3V. This feature provides for the use of the ISO7041 in both thermal and power constrained system designs. The device can operate as low as 2.25V, as high as 3.6V, and is completely functional with different supply voltages on each side of the isolation barrier. The isolator is provided in a 16-QSOP package with three forward-direction channels and one reverse-direction channel. The device offers default output high and low options. If the input power or signal is lost, the default output is high for the ISO7041 device without the suffix F and low for the ISO7041F device with the F suffix.